You might as well know from the start - this is a girl's story. The girl, Valli Amma, was a princess of sorts - a stone-age jungle princess who grew up among the prehistoric hunting people of the island now called Ceylon or Sri Lanka. Mind you, this happened many thousands of years ago at a time when Sri Lanka was still connected to India by a land bridge. 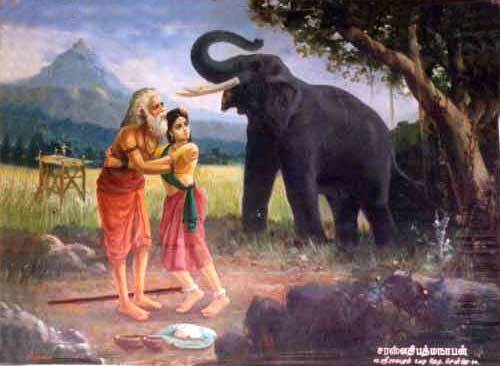 Valli, who was only twelve years old at the time, had her heart set on Kande Yaka, the age-old hunting God of the Kataragama Mountain whose power and wisdom - they say - was beyond human understanding. The Spirit of the Mountain was so touched by Valli's innocent love that he came down to earth in disguise to touch her in return - but she wouldn't let him! Of course, they both fell in love at last, and their love story still continues to this day in far-off Sri Lanka. In the Indian Ocean not far from India lies a teardrop-shaped jewel of a tropical island called Lanka. Many thousands of years ago - nobody knows for certain when - Stone Age people of ancient India walked to Lanka across a narrow bridge of land, called Adam's Bridge, and populated this island of paradise. Their descendants today call themselves Wanniya-laeto or 'inhabitants of the forest.' But most Sri Lankans call them Veddas, meaning hunters. Veddas believed that the spirit of a great hunter lived upon a remote mountain peak within sight of the Indian Ocean. Kande Yaka, the Great Mountain-Spirit and Hunter-God, was the Vedda people's greatest friend and guardian spirit, then even as he still is today. No successful hunt began without Vedda hunters first dancing themselves into a trance-frenzy in which Kande Yaka spoke through them, telling them where to hunt and how to survive happily. But the Vedda people also knew that Kande Yaka was easily angered, so all regarded him with a mixture of love, respect, and fear. Now Veddas are a people who are accustomed to marvelous occurrences. So when Nambi, the chief of the Kataragama Veddas, and his wife one day discovered a baby girl in the jungle, they were overjoyed because they had been praying for a daughter, and yet nobody considered it a miracle. They called her Valli, meaning 'Sweet Potato,' because they found her in a patch of yam or valli creepers. Some say her real mother was a red deer, so perhaps Valli also had reddish hair and wide innocent eyes of a doe. 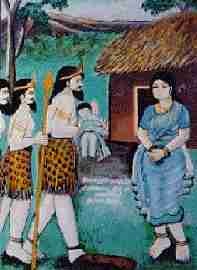 Others say that since Nambi was the Veddas' chief, therefore Valli was a Vedda princess. But all agree that Valli was the sweetest child anyone had ever seen, and everyone adored her. Valli's girlfriends loved her too, but they couldn't help but tease her about the peculiar vow or promise she had made. Valli was twelve years old and her girlfriends were always talking about brave, handsome Vedda boys who were already hunters themselves. But Valli had vowed to herself - and to Kande Yaka - that she would only accept Kande Yaka and no one else as her life companion. All the other Vedda girls laughed and teased Valli for vowing to marry a god whom no one had seen. 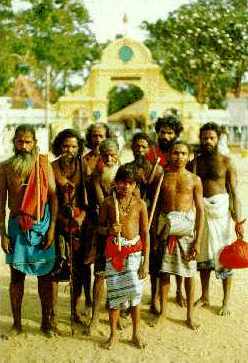 But Kande Yaka had been watching all his Vedda people - including Valli - with great interest all this time. The hunter-god of the Mountain was as old as the mountain itself, but as a spirit he was also young just like Valli. Before long, the ever-youthful Kande Yaka felt so attracted to Valli that he decided to come down from his mountain and meet her. At the time, Valli's family had cleared a small patch in the jungle near Kataragama Peak and were growing millet there. But someone had to stand guard against parrots and other birds that came to eat the millet. Valli, who grew up in the jungle, was not afraid of being alone, so her father sent her to guard the field while he and Valli's brothers went hunting with bow and arrows. Day and night Valli's sweet voice could be heard as she sang to the birds and animals, warning them to keep away and twirling a sling that she used to fling stones if they ignored her and tried to eat the tender millet. Kande Yaka could see that this was his chance to meet Valli alone face-to-face. So just like you or I would put on a fresh change of clothes, Kande Yaka put on the human form of a handsome young hunter. He figured this would be the best way to impress her. Pretending to be tracking a deer, he strolled out of the forest and into the millet field. Of course, Valli could not recognize the handsome stranger. "Hey, get out of here fast and don't come back!" she yelled, adding "Who do you think you are?" Poor Kande Yaka was just about to apologize and retreat back into the forest when suddenly there was the sound of drums - Nambi and his hunters were bringing Valli some mangoes and honey to eat. The moment Valli looked away, Kande Yaka turned himself into a tree. As soon as the hunters left, the god reappeared in human form and confessed his love for her. Valli was shocked and angry, and told the stranger to beware or her brothers would come back and go wild if they saw him there alone with her. Just at that moment there was the sound of footsteps and they knew that Valli's family was coming back. In the blink of an eye, Kande Yaka changed himself into an old man with long gray beard bent over with age. Valli's family paid their respects to the kind old man and suggested that Valli would be good company for the old man as long as he stayed. As soon as the hunting party left, the old man told Valli that he was hungry, so she gave him some millet flour mixed with honey. This only made him thirsty, so she took him to a stream and gave him water to drink. Then he told her: "Now that you have satisfied my hunger and thirst, do satisfy my love for you." This was too much for Valli - so she gave the strange old man a piece of her mind and was about to start back to the clearing. Kande Yaka mentally asked his brother the elephant-god Ganesha for assistance. Instantly from out of the jungle from behind Valli came Ganesha in the form of a wild trumpeting elephant. Valli got the fright of her life, rushed back into the arms of the old man and begged him to save her. "I'll save you," he said, "but on one condition. You must marry me." There was no time to argue, so Valli agreed. 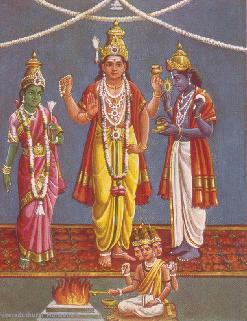 No sooner did Valli agree to the stranger's condition than he revealed himself as Kande Yaka, seated on a peacock and surrounded by dazzling light. Valli was thrilled to see that it was her beloved god and after that they were never apart. Never, except the time of harvesting the millet approached, and her family called Valli back to their tribal hamlet. 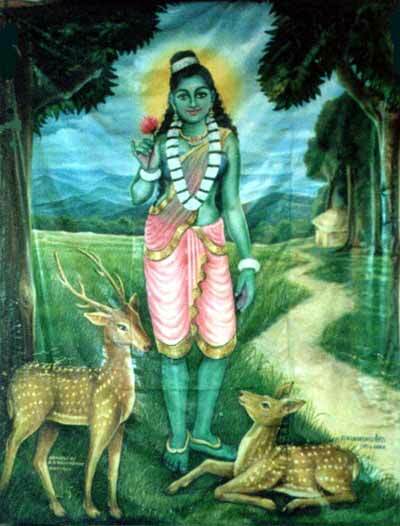 Kande Yaka was awfully upset when he came to the clearing and could not find Valli. So late at night he slipped into the hamlet and together they ran away. 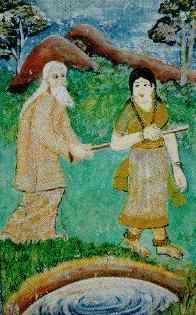 When Vedda chief Nambi woke up in the morning, he figured out that Valli had run away with the old man and was furious. He organized a search party and set to get revenge. When they found them, they released a volley of arrows, but instead of killing the mysterious old man, the Veddas all fell dead instead. Valli was stricken with grief to see her relatives dead. Seeing her grief, Kande Yaka told her to revive them to life, which she did simply by touching them. 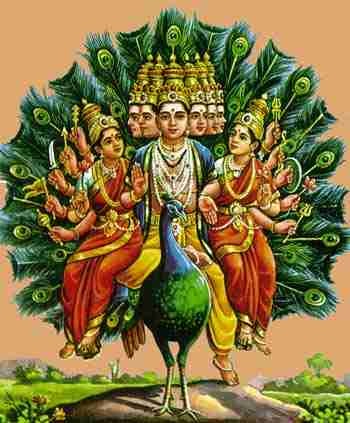 The Veddas at once realized that Valli's friend was the great God of the Mountain himself, and they all fell down to worship him. Valli's parents gave their consent for the couple to be married and the whole village rejoiced. Since that time long ago, Valli and Kande Yaka have never left Kataragama and never died, either. And they still have fun like other children, playing hide-and-seek with each other and with their devotees, who come in search of them from all over the island and even from far, far away. And if you don't believe it, you can go to Kataragama and find out for yourself. This story was published in Asian Tales and Tellers by August House Publishers in 1998.